Astronaut photograph ISS056-E-94636 was acquired on July 10, 2018, with a Nikon D5 digital camera using a 1600 millimeter lens and is provided by the ISS Crew Earth Observations Facility and the Earth Science and Remote Sensing Unit, Johnson Space Center. The image was taken by a member of the Expedition 56 crew. The image has been cropped and enhanced to improve contrast, and lens artifacts have been removed. The International Space Station Program supports the laboratory as part of the ISS National Lab to help astronauts take pictures of Earth that will be of the greatest value to scientists and the public, and to make those images freely available on the Internet. Additional images taken by astronauts and cosmonauts can be viewed at the NASA/JSC Gateway to Astronaut Photography of Earth. Caption by Andrea Meado, Jacobs Technology, JETS Contract at NASA-JSC. An astronaut aboard the International Space Station (ISS) shot this photograph of Momotombo Volcano in western Nicaragua. This active stratovolcano was once described as “the smoking terror” in a 1902 stereograph set. In 1898, Lieutenant Walker of the U.S. Navy surveyed Nicaragua for a potential canal route. 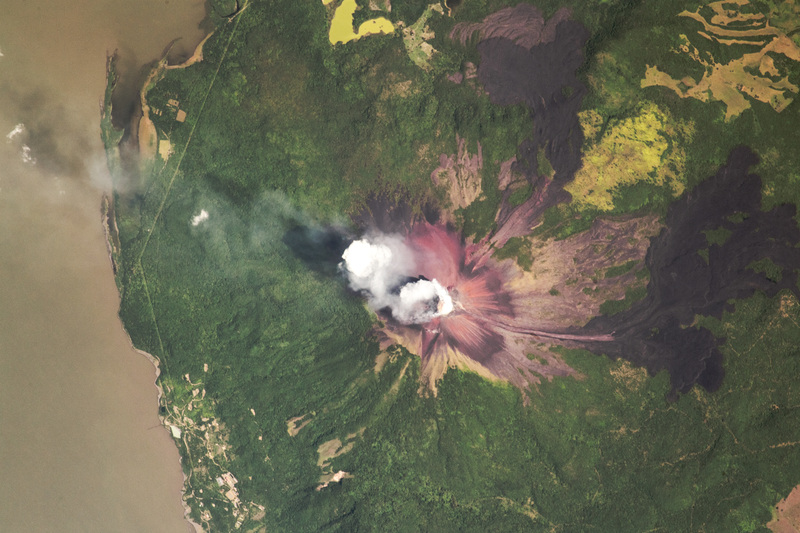 As Walker traversed the area near Momotombo, he described the volcano as a lofty, sulfur-stained peak emitting large volumes of vapor from the summit. The plume in this July 2018 image may be similar to the vapor described by Walker. Seven years after Walker’s survey (1905), Momotombo erupted. More than 100 years later, a new eruptive phase began in 2015. A channel runs down the eastern flank of the volcano, where lava has reached low-lying surroundings. This channel existed before the 2015 eruption, so it gave the most recent lava flow an easy path down from the crater. Lava levees appear on either side of the channel as dark rock. A geothermal field surrounds Momotombo, and it has been used to produce renewable energy since 1983. Hot fumaroles—openings at Earth’s surface where volcanic gas or steam is emitted—are found around Momotombo. The presence of fumaroles indicates that magma is near the surface, creating the hot conditions for geothermal energy to be harnessed. Due to the northeastward subduction of the Cocos Plate beneath Nicaragua, many volcanoes can be found along the country’s western coast. Just north of Momotombo lies the Monte Galán caldera, a circular volcanic depression filled with older volcanic deposits, vegetation, and small lagoons. Momotombo also shares a lakeshore with the dormant Apoyeque Volcano along Lake Managua. Together they make up a small portion of the greater Ring of Fire.